Our Classic II Bar Height Outdoor Table Base is made of aluminum, and fits 30" to 36" table tops. Levelers on each foot are included. This particular table base is ideal for installations with umbrellas. Finish options include: Charcoal, Silver, or Bamboo. 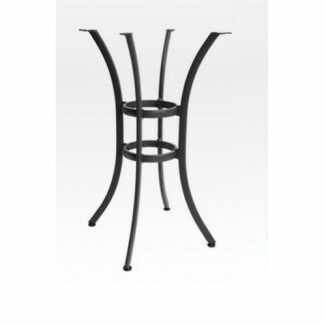 This piece in our Outdoor Bar Height Table Base Collection is In Stock, with a lead time of 1.5 - 2.5 weeks from the time your order is processed.